The Finger Lakes Workforce Investment Board is seeking applicants for the One Stop Operator for the period of 7/1/17-6/30/18 with the option for renewal. Please see the RFP. 5th Annual Healthcare Career Day on March 22nd!!! Career Exploration Day for 9th and 10th grade students in Ontario, Seneca, Wayne and Yates Counties interested in learning more about current and emerging careers in Human Service and Healthcare fields. If you’re a parent/guardian wondering if your school has signed up, you can contact our office at 315-789-3131 or contact your school! 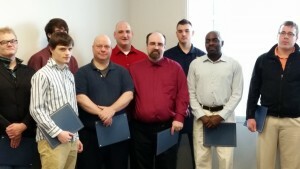 Congratulations to the FLCC Mechatronic Technology graduates. Your hard work and dedication paid off. Best of luck in your new jobs!